This beautiful apartment on the 10th. 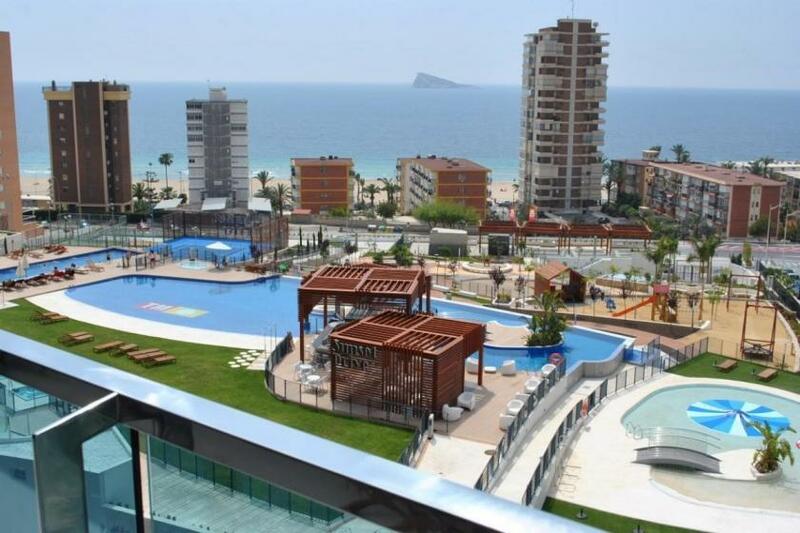 floor is situated in the Sunset Drive complex in Benidorm, Playa Poniente area. This apartment offers an open kitchen and living room area with sofabed, air conditioning, high speed Wifi, IP Internet Based TV with all European channels. Sunset Drive consists of a total of 264 apartments up to 24 floors. On the ground floor you will find some business premises, a underground and outdoor parking and a huge communal area of 13.000M2 with 3 swimming pools which one is heated, heated whirlpools, dry & wet bars, gym, Finnish sauna, hamman & Jacuzzi’s. The children have their own pool-lake with water games, several play areas with slides and swings as well as a small movie theater.